What if one of the most important libraries in the Middle East is not a library at all, but a collection of dresses stored in the house of a single woman? What if it is not books, but wedding dresses and century- old robes, sewn in a dizzying array of colors and with delicately embroidered sleeves and chest pieces, that contain the most complete stories of the world of cities and villages in pre-1948 Palestine that have now all but disappeared? When I set out to find Widad Kawar, the owner of what is thought to be one of the largest existing collections of Palestinian costumes in the world, it was because I suspected that this is the case—that Palestinian dresses contain secrets not only about the women who embroidered them, but about the entire chain of relations that existed in the Middle East before 1948 between fabric merchants and dyers, weavers and silk producers, traders and embroiders, and brides on their wedding days. Though a few women worked on a single dress, an entire region made it possible. I was curious. Why had Halimeh been so desperate to keep her dress from being cut into pieces? 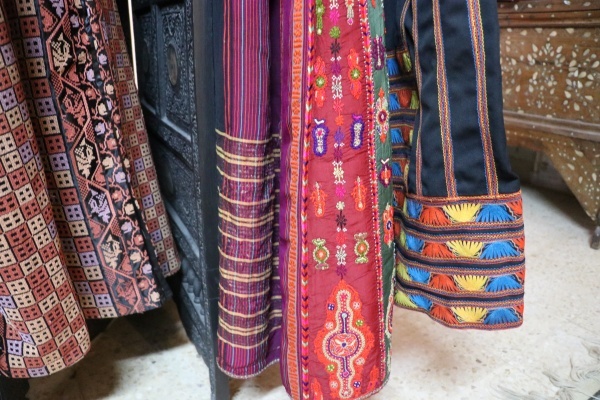 What secrets lay hidden not only in the embroidery of Palestinian traditional dresses, but in the way the different pieces of the dress are stitched together: the fabric, the threads, the embroidery, the patterns, all sewn together into a whole? What if the dress was not a dress at all, but was also a story, a map? I met Kawar in her home in Amman last year, a space decorated with mother-of-pearl Syrian furniture and embroidered tablecloths, located just behind the Tiraz Museum, the new space created to house pieces from her collection of Palestinian and Jordanian dresses and jewelry. Though I had given scant notice of my arrival, she welcomed me eagerly, anxious to ask about my Palestinian students and to hear about Bethlehem, her childhood hometown. 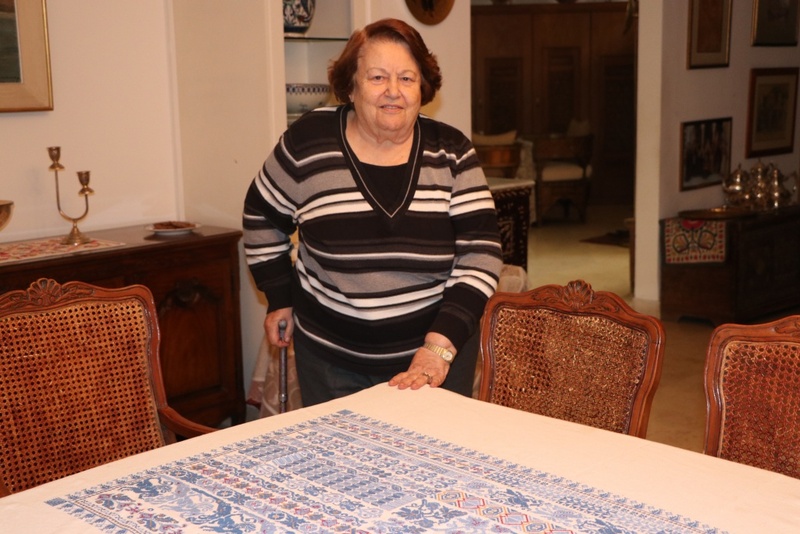 The only details that betrayed her age is her long, personal knowledge of Palestinian embroidery culture—one that stretches all the way back to its pinnacle in the British mandate Bethlehem of her childhood, when the city was a famous embroidery center. Looking back, it is easy enough to feel that everything in Kawar’s life was leading her to collect Palestinian dresses. Born in the 1930’s in Tulkarem, she was raised in Bethlehem, where she grew up watching the local women embroidering in their homes. 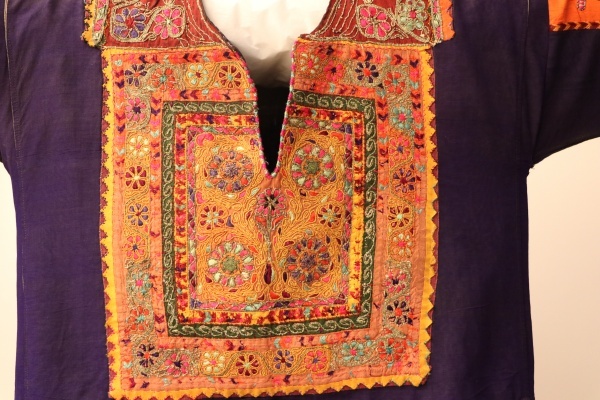 During this time, Bethlehem women were famous for their couching technique, and their chest pieces, sleeves, jackets and other embroidery became prized for the wedding dresses of women throughout Palestine. Kawar would watch on market day as women from the Jerusalem villages descended on her city to buy threads and fabrics, or to order embroidered pieces. She vividly remembers their colorful gatherings: she could have no way of knowing that these villages, famous for their dresses, would soon be depopulated in 1948. 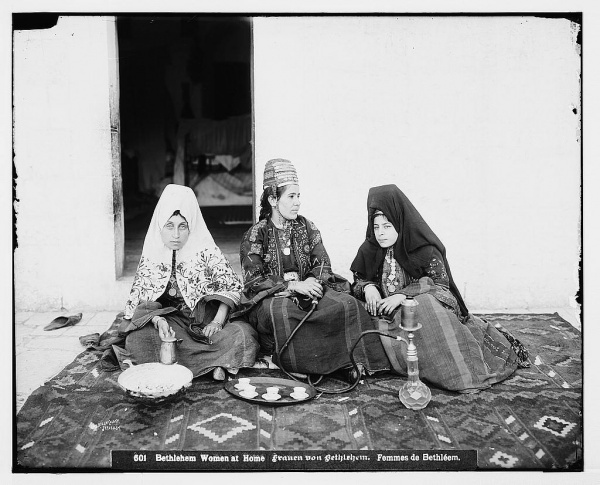 Bethlehem women at home, in traditional costume. Photo dated between 1898 and 1914. American Colony Photo dept, collection of the Library of Congress. Kawar attended school in Ramallah, another well-known embroidery center, where she became familiar with an entirely different embroidery technique: the red cross-stitch on a linen background for which the city is renowned. 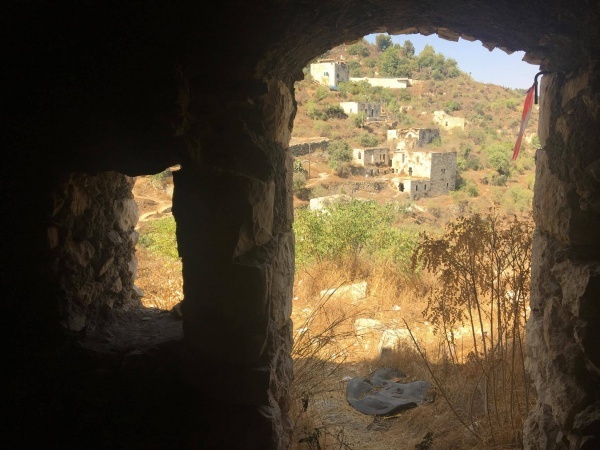 But it was her summers in her ancestral village of Aboud, an ancient Christian village in the northern West Bank that were perhaps most important of all. There she became familiar with village culture and the women who sewed their stories into their dresses, particularly for their wedding days, and she began slowly and tentatively collecting her first pieces. These three diverse experiences—Bethlehem, Ramallah, and Aboud—all prepared her for the diversity of Palestinian embroidery, where each of hundreds of Palestinian villages developed their own unique patterns, and where it was possible to recognize a woman’s hometown based solely on what she was wearing. But soon, this entire culture would be upended. In 1948, the Palestinian Nakba sent hundreds of thousands of Palestinians from historic Palestine into exile, completely upending Kawar’s world. The villagers who had come to Bethlehem on market day in their colorful clothes were no longer there. The women of al-Maliha, Lifta, and ‘Ayn Karim were now spread out in refugee camps across the region. Kawar felt that something needed to be done to preserve their memory. “Each item calls to mind an individual or a place: a wife, a mother, a daughter, a family, a house, a village, a town, a field, a market,” she wrote in Threads of Desire. 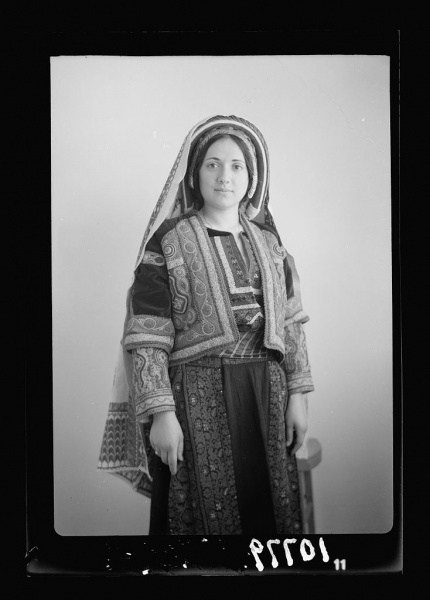 The thob, or Palestinian dress, was no longer simply a costume, but proof of how rich and diverse Palestinian society was before its people were uprooted. Kawar attended university in Beirut, where she was met Phyllis Sutton, an English teacher who was also a pioneer in collecting and studying Palestinian embroidery, and who formed a circle to teach embroidery to Jordanian and Palestinian students. Momentum was building. In the early 1950’s, Kawar married and settled in Jordan. 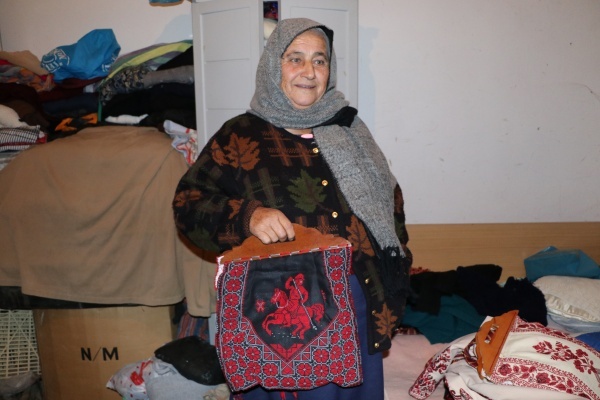 Her husband’s family, Damascenes who had settled in Nazareth, added the final missing piece of the puzzle—an appreciation for the Syrian textile culture that was an essential element of Palestinian dresses. Soon she was learning about silk textiles from Aleppo and Damascus. 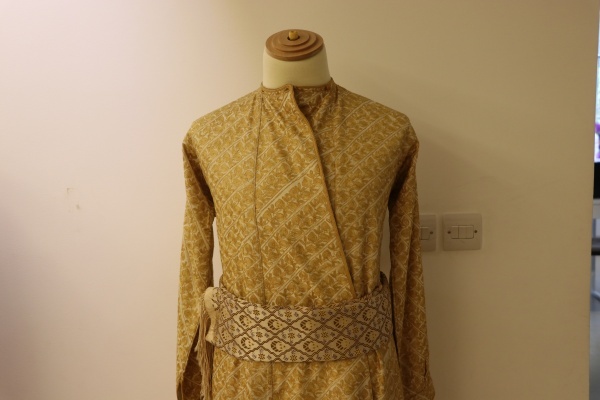 A Palestinian men’s qumbaz, made from the ghabbani fabric of Syria. From the collection of Widad Kawar. In the meantime, thousands of refugees had been displaced from their villages and were filling up refugee camps throughout the region, especially in Jordan, Syria and Lebanon. Spurred by intuition, she knew that an entire world of heritage was disappearing, and she would need to act quickly if she was going to save it. Today, the Widad Kawar collection is thought to be one of the largest collections of Palestinian dresses in the world, a result of decades of collecting dresses from the length and breadth of historical Palestine. In as many cases as possible, Kawar insisted on buying dresses directly from the women themselves, taking the opportunity to interview them about the historical background of every piece. Though in the beginning she collected only pieces she liked, after the war of 1967—when the scale of the threat to Palestinian heritage became fully apparent—she began to collect complete costumes from every region of historical Palestine. She recognized that the pieces were not only stories: they were personal testimonies. Folded dresses showing couching stitching from Bethlehem. The private collection of Widad Kawar. For Kawar, Palestinian dresses tell the story of family and community. When I asked her why Halimeh had not wanted her dress to be torn apart, she explained that a dress was not only about the embroidery, but about the connections that were formed in the fashioning of it. A girl would begin to learn to sew when she was as young as seven years old. Slowly as she grew older, she would embroider the individual pieces for her bridal trousseau. But when the engagement came, the women of the family—sisters and aunts—were obligated to come together to help sew the pieces together. The dress was a work of community. 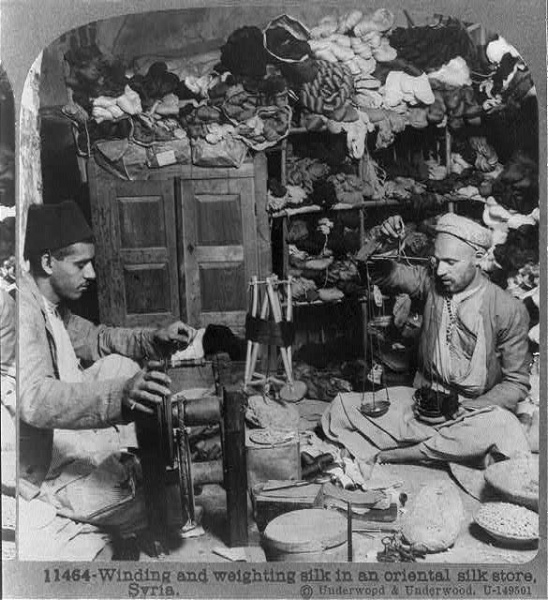 Winding and weighing silk in a silk store in Syria, 1914. The Library of Congress Collection. In addition to her many authoritative books on Palestinian embroidery, in 2014, Kawar opened Tiraz: The Widad Kawar Home for Arab Dress in Amman, a museum that exhibits rotating selections of her dress collections from historical Palestine, Jordan, and the larger Arab world. It assures that this most valuable library will be available to future scholars, as well as to Palestinians hoping to connect with their heritage. In addition, Tiraz holds regular workshops to teach a new generation about ancient arts such as embroidery, dying, and weaving. 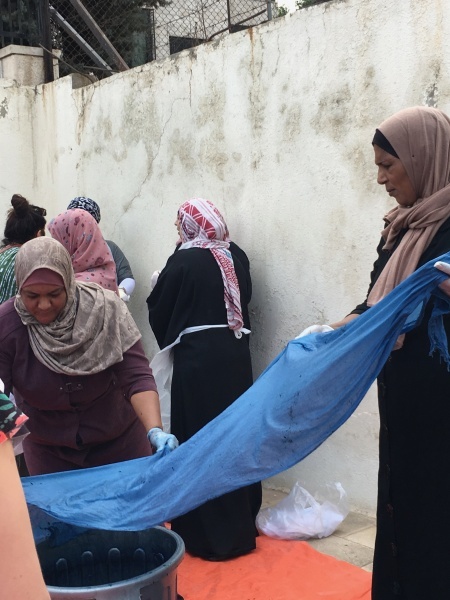 A workshop on traditional indigo dying from the Ghor al-Safi region at the Tiraz Center. 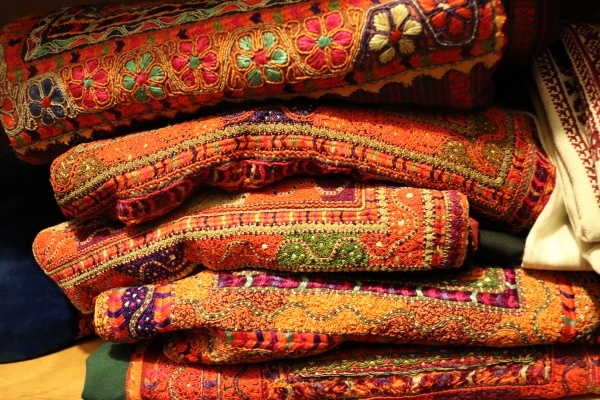 In the meantime, embroidery has managed to remain a vital part of Palestinian culture. Young Palestinian designers are continuing to incorporate it into their work: the well-known designer Rami Kashou recently added hand-stitched Palestinian embroidery to a line of ball gowns, and brands such as Taita Leila are modernizing Palestinian embroidery by adding it to shirts cut in the latest fashions.It remains alive in Palestinian diaspora communities around the globe, with women’s cooperatives in refugee camps in Lebanon and Jordan producing items for sale. 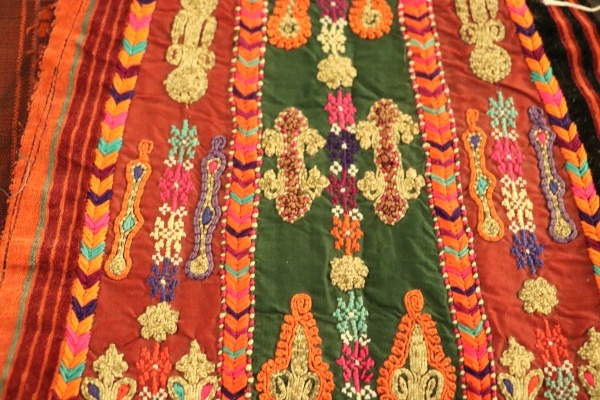 A collection of hanging dresses show off the diversity of textiles and embroidery in Palestinian dresses.